In January my oldest daughter turned 12. In our church 12 is kind of a big deal. Like that of a Mexican Quinceanera or a Jewish Bar Mitzvah, 12 marks the passage of childhood into young adulthood for our kids. Girls enter the Young Women's program, where they focus on eight values as they build their faith and increase their understanding of all things spiritual. I decided to mark her birthday milestone with a quilt. Each value has a color associated with it, so that was my starting point. 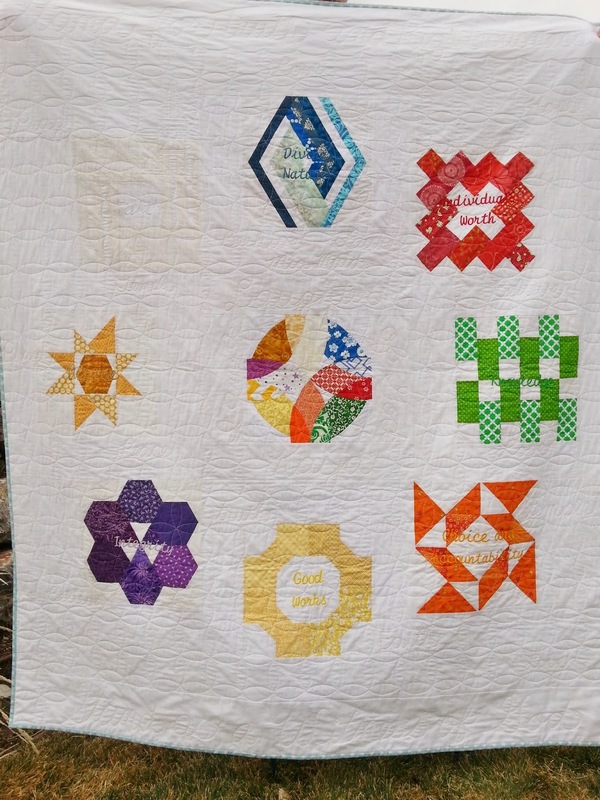 With the help of the Sew Pieceful Swap group this quilt came together in record time. I started it in November and had it done in time for her birthday in January. That is super fast for me! 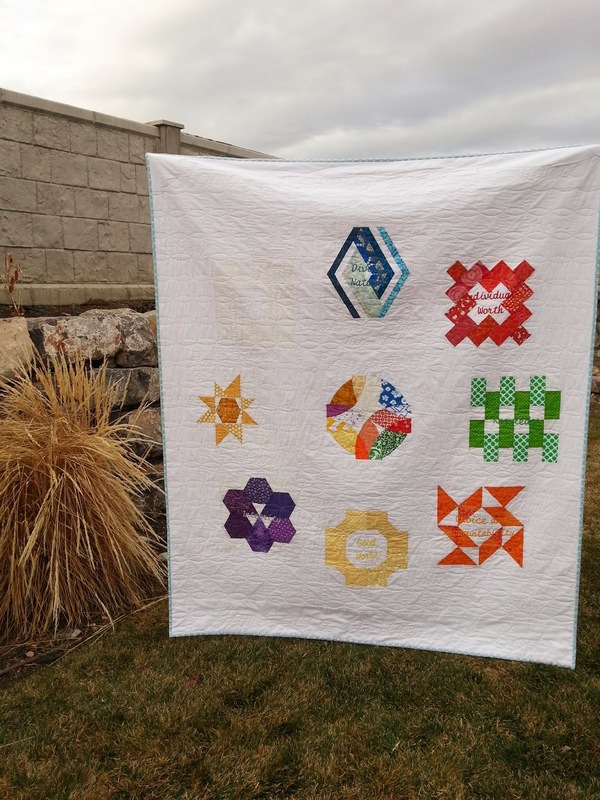 The quilt design was a giant take on this block I made for my pinterest sampler. Can you see it? The design gets a little lost with the white block disappearing in the upper left corner, but I wanted to stay true to the value colors. In hindsight I probably should have used a different background color, but oh well. My quilter stitched words into the quilting, along with my daughter's name and part of the Young Women's theme. 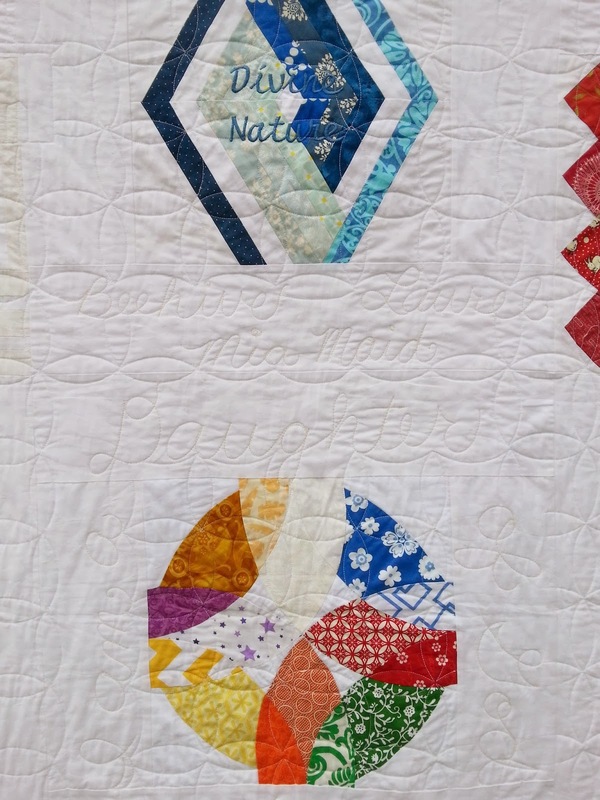 She also embroidered each of the value names on their corresponding color blocks. That rainbow block in the center is by far my favorite part, though! For the back I used a reclaimed sheet that has multi-colored polka dots. The binding is an aqua/white (my daughter's favorite color at the moment) dot from the DS line at JoAnn's. My daughter loves her quilt and loves being in Young Women's. She is rapidly growing up and becoming a beautiful young woman that her mom can be proud of. 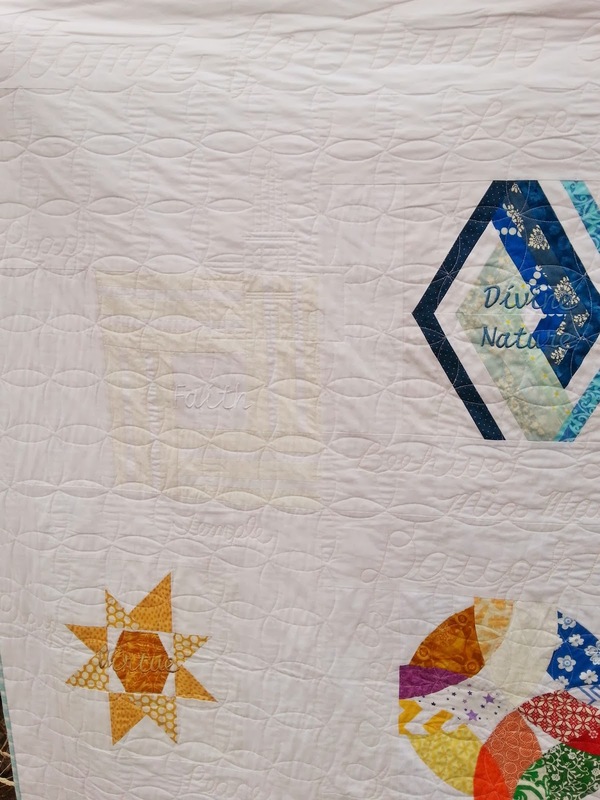 What a beautiful quilt and a lovely way to commemorate her journey into a young adult. Well done.